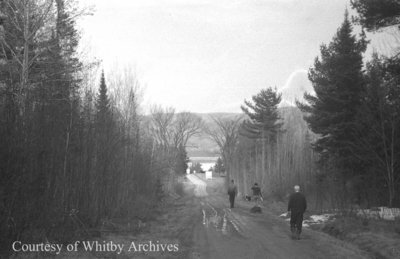 A black and white negative of three unidentified Ruddy family members walking down a dirt road towards a lake in Deep River, Ontario. The three unidentified people have their backs to the photographer. Byeways Lodge was located off Highway 17 just west of Deep River, Ontario along RR1. According to the North Renfrew Times, the Byeways lodge was destroyed in a fire May 24, 2000. Byeways Lodge, April 21, 1941, Marjorie Ruddy. Whitby Archives A2013_040_752C.